If you are looking for the modern RuneScape guide for this content, please see our Grim Tales guide. "Once upon a time in a land far, far away..." Sylas, a collector of items both wondrous and unusual seeks out the latest additions to his trove with a somewhat unusual prize for the finder. Speak to Sylas who can be found south of the Taverly House Portal. Head to Sylas who can be found south of the Taverly House Portal, and speak to him. He will tell you that you need Beans, however to get them you will need to get 2 items for him, the first being a Griffin Feather. 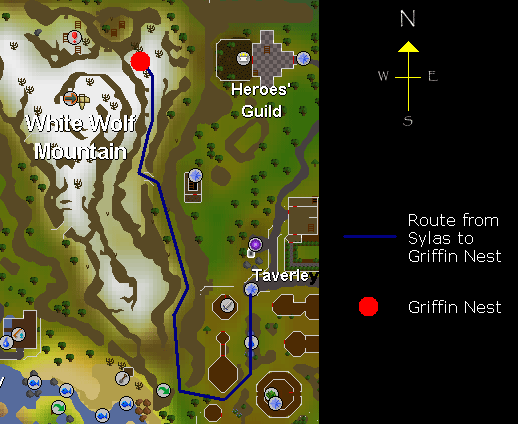 The Griffin Feather can be obtained from the Griffin that is found in its nest on White Wolf Mountain. 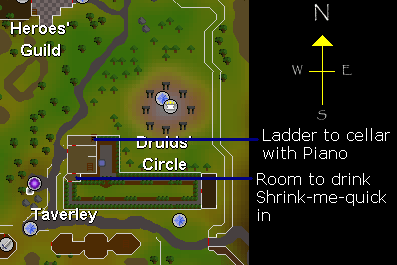 See map below for location of nest and how to get there from Sylas. Talk to the Griffin and it will say that it is hungry and wants to eat your legs. When there is a multiple-choice option, choose that "I heard you were a great and mighty Griffin!" and you can go straight onto the story, otherwise you will get hit 10-20 damage and have to start talking to him again. If you chose the wrong option, talk to him again and he will say that he wants a bed time story told to him with lots of death, fire and destruction. 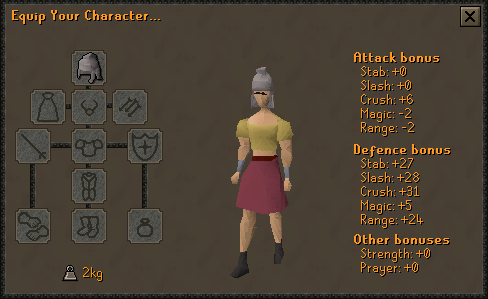 You will start telling a story, and at 6 points will have to choose an option to make Grimgnash like it. If you choose the wrong option you will get hit similar to when you first talked to him (if you chose the wrong option). The correct options have a box around them in the below image. If you get anything wrong, you won't have to start all over again, but just carry on from the point that you last got something correct. Once you have finished the story he will fall asleep and you can take the Griffin Feather beside him. Take this Feather back to Sylas and he will tell you about the other item he wants you to get. There will then be a number of options, and he will tell you that his prized possession is a horn-less Unicorn! More talking will reveal the location of Rupert, the owner of the Helmet, to be south of the Mind Altar, east of Goblin Village and west of Ice Mountain. 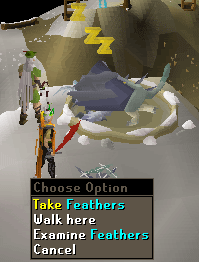 Teleporting to Falador would slightly speed up your journey, otherwise a basic walk will do the job. Once you are there climb over the crumbling wall found between the 2 Bushes on the east side of the tower. Now that you are over, speak into the Drain Pipe. You will find that Rupert is at the top of the tower, and you will offer to help him. Unfortunately you are overheard by Miazrqua, princess of Asgarnia. Head back over the wall, head north of the tower and talk to Miazrqua - somebody who is holding Rupert prisoner! Once you have talked to her, head back to the Drain Pipe, and speak into it again, saying "I could try and climb up." and "Is there anything up there that can help?" when there are multiple choice options. 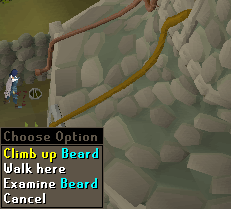 Rupert will release his Beard and you should climb up it. Talk to Rupert who will explain his situation and tell you to speak to Miazrqua. Head back down the Beard, over the Wall, and talk to her, even if the introduction isn't wonderful. She will explain her problem, and tell you that her 2nd cousin twice removed is the Witch encountered during the Witch's House Quest. When she was visiting her cousin's house, she dropped her Pendant and a mouse took it. More talking will get her to give you the Key to enter the house. Head to the long house in Taverly used during the Witch's House Quest, bringing 2 Water Filled Vials and 2 Tarromin with you to save time later. Another helpful thing to bring is a teleport of some kind to save you having to walk through a maze again in the opposite direction. Head down the ladder in the northern part of the house and search the Crates, Boxes and Stacks until you find a pair of Leather Gloves. Equip the Gloves, go through the Gate, and search the Music Stand to find a Music Sheet. Read the Music Sheet, and remember the order of the notes. Writing them down on a piece of paper is one way to do this, while taking a screenshot is another. Head back through the Gate and choose to play the Piano, playing the notes that are on the Music Sheet in the order they are in on the sheet. 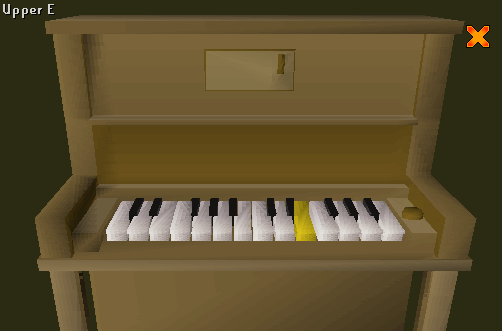 Once you have played the notes correctly, a compartment on the Piano will open that you can search to find a Shrinking Recipe, To-do List and 2 Shrunk Ogleroot. Reading the Shrinking Recipe will come up with the recipe that you need. Add the Tarromins to the Vials of Water to get 2 Unfinished Potions. 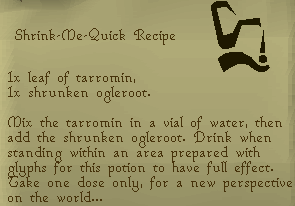 Add the Ogleroots to get 2 Shrink-me-quick Potions. If you accidentally drink, or lose, either of these Potions, you can get more Ogleroots by killing the level 109 Experiment No.2s which are found below the manhole outside the Witch's House. They will drop Ogleroots as well as Unidentified Herbs - several Herbs at a time. Climb up the ladder out of the Basement, and head to the small room to the south of the house that leads into the garden as well as having a Mouse hole in it. 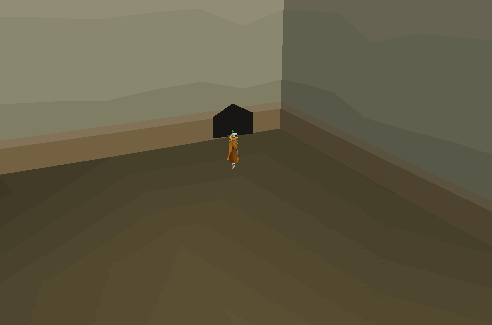 Once in this room, drink one of the Potions and you will view a cut-scene in which you shrink and walk into the hole. Once through the hole, you will be in a strange world where everything looks large. 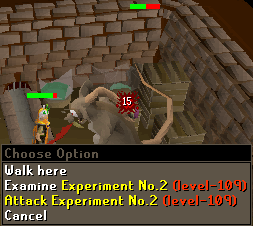 If you decide to kill one of the level 95 Mice, the drops that appear will appear to be massive! Although they may be there, there isn't a need to kill any of the Mice that are around, but instead you will have to navigate through a maze consisting of climbing up nails. At the end of the maze you will find the Pendant. Take the Pendant, then make your way out of the maze. The easiest way is to Teleport out, although if you don't have a teleport, just follow the maze back in the opposite direction. Take the Pendant to Miazrqua, and there will be a cut-scene showing Rupert coming out of the tower, shouting 'FREEDOM' in the process. 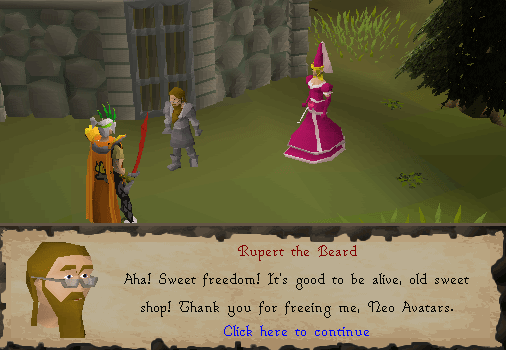 He is grateful for you freeing him, and will give you some armor as a token of thanks. You will ask for the Helmet, which he will give to you, and you should take to Sylas. Now that he has got the 2 items he wanted, he will talk about what he now wants you to do. 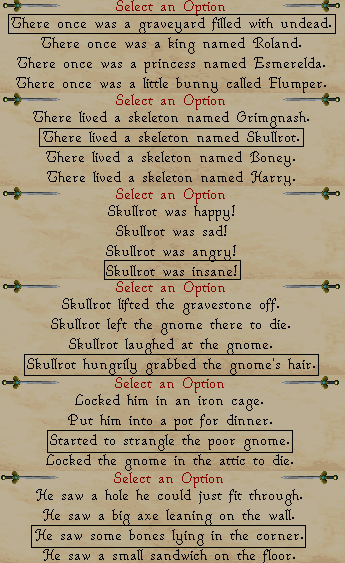 Legend has it that once upon a time there was a Goblin called Gubblebak that was in the Smithing industry, and one day he fell into a pot of molten Gold. The natural instinct for him was a jump into cold water, however all this did was harden the Gold so that he got trapped. This Golden Goblin is what is wanted from you now, and Magic Beans will help you find it. The Beans will need to be Planted in a patch south-east of Sylas, and south-west of the Taverly Wood Tree Farming Patch, and watered. The grown plant will then be climbed, the Giant at the top slayed, and the loot brought back down. Once the Beans have been planted in the Earth Mound, water them with a Watering Can, and a fast growth will happen in the form of a cut-scene. Now that the Beanstalk has grown, you will need to get ready for battle before climbing it. The monster at the top is a level 138 Giant called Glod who uses a Melee attack. 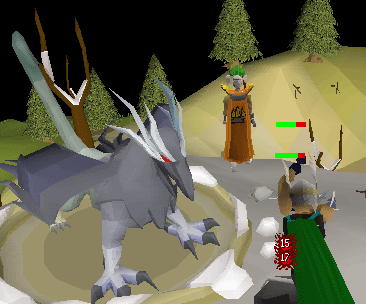 During the battle if you are using Prayers such as Protect from Melee, they will randomly be turned off a certain points, and a number of Prayer Points, about 20, will be taken away from your Prayer. 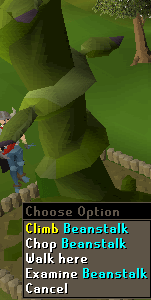 Due to this, taking Prayer Potions along with a few pieces of good Food with you is a helpful thing. When your Prayer is off, you will be at danger from hits hitting into the high teens, so high healing Food will mean that less time is wasted eating. 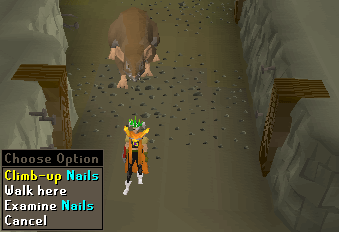 The Prayer Potions are suggested since Prayer Points will be removed, and it is a lot easier to try and keep Prayer on as much as possible than eating after every hit. If you don't want this problem to occur, you can hide behind the rocks that are scattered around the battleground and Mage or Range from behind them. 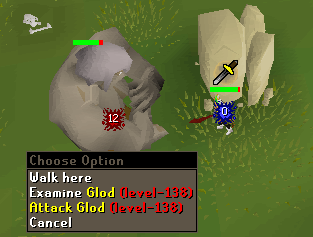 When you get called towards Glod, quickly turn on Protect from Melee to stop damage being hit, then run back to your safe spot to carry on killing. He also has other effects that will take place during the battle. He will heal himself, so the battle will last even longer, and relying purely on Food is even less sensible. He also will make chants that will bring you towards him in anger to fight, and also make you run away. When you are running away, it is wasting time, so having Auto-Retaliate on is helpful. If you do want to escape, but don't have the ease of a Teleport, climbing down the Beanstalk is an option, although you may get stuck on the rocks scattered around, or on Glod himself, so leaving a couple of pieces of food before an escape run is sensible. Before heading into battle, drinking a Super Set will help speed up the Battle, and get you hit less if you don't have Prayer above your head. Once you have all the Armour, Weapons, Food and Potions you want, climb the Beanstalk and be prepared to fight hard. As long as you have the right equipment, the battle shouldn't be too hard, and you will come out victorious with Glod dead. Once he is dead he will drop an Uncut Ruby, Uncut Sapphire, 2 Big Bones, a Watering Can (4) and the Golden Goblin. 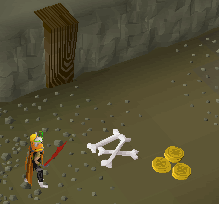 Pick up the Golden Goblin, and if you wish to do so, pick up the rest of the items that he dropped. 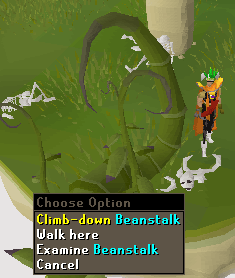 Climb down the Beanstalk and take the Golden Goblin to Sylas who will tell you that the Beanstalk needs to be cut down incase any of Glod's friends try to come down it. 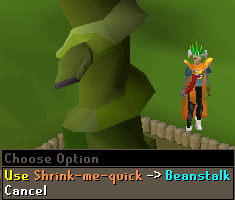 With the second Shrink-me-quick Potion and a Woodcutting Axe, head back to the Beanstalk and use the Potion with it. 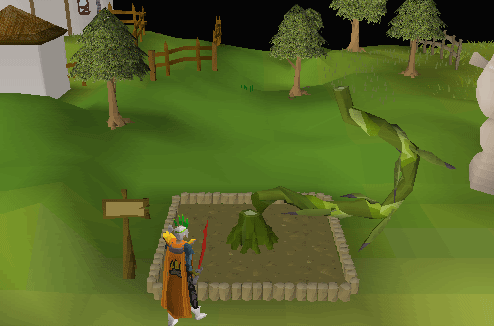 It will become thinner, and you will be able to cut it down with a Woodcutting Axe, showing another cut-scene. 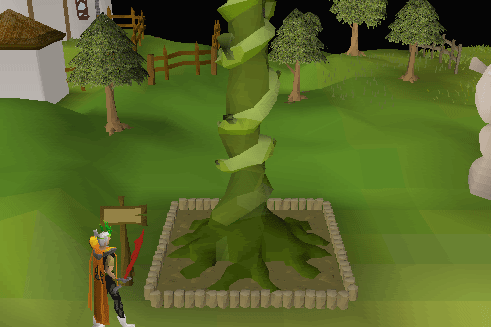 Now that the Beanstalk has been chopped down, head back to Sylas and talk to him. He will explain about the helmet, and the secrets of how it made Rupert's hair so strong. He will also say that you can keep the Helmet.